Patients waiting to collect their medication. Zimbabweans had been hoping for a fresh start when Robert Mugabe's 38-year rule came to an end in November 2017. But 14 months on, a brutal crackdown on fuel protests, which has left up to a dozen people dead, has the country on edge and is likely to make existing food and health problems even worse. The country abandoned its national currency in 2009 in favour of a multi-currency system, and has since suffered from a decade-long currency crisis. This has led to instability in the price of goods and services - an instability compounded by the new unrest. "The current problems in Zimbabwe are both political and economic," said Michael Tichareva, an independent financial expert based between Harare and Johannesburg. He attributed the roots of the current crisis to a combination of corruption and gross mismanagement of public institutions by the long-ruling ZANU-PF party. "The political problems are actually stronger than the economic problems," he said. "Once the major political parties have a common purpose of developing Zimbabwe, and engage in a nation-building dialogue in order to bring unity, then the economic problems will most likely disappear." The country's agro-based economy is crippled - largely due to droughts, poorly integrated climate risk management policies, and a lack of state support for small-scale farmers who grow most of the country's food. FEWS NET, a US-funded food security and malnutrition watchdog, says economic challenges and below-average rainfall this season will directly affect livelihoods and food security in large parts of the country - mostly for poor households, but also for some who are better off. Shortages of basic food commodities include cooking oil, sugar, flour, and bread. On 12 January, Mnangagwa's announced a 150 percent increase in the price of fuel - an attempt to stabilise supplies as Zimbabwe struggles with what is its worst shortage in a decade. This led to calls for a nationwide stay-away, which then escalated into mass street protests in the main towns and cities across the country, and a deadly crackdown by police and the military. Mnangagwa, who was in Europe when the unrest began, cut his trip short, cancelling his attendance at the World Economic Forum in Davos, and promised that the violence - which he blamed on "rogue" elements in the security forces - would be investigated. The hope for a new era that accompanied Mnangagwa's election win last year is fast evaporating amid recriminations over a heavy-handed state response that has led to comparisons with his predecessor. Nelson Chamisa, leader of the opposition Movement for Democratic Change, has said the people of Zimbabwe are facing an existential threat and warned of "a far worse humanitarian crisis with devastating consequences". "In some instances those victims have no idea where to go to seek medical attention," she said. 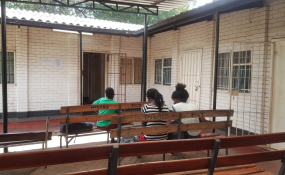 "In other instances, where they have been provided with support, the state is putting impediments that are obstructing these victims from accessing the healthcare facilities." Gorejena said doctors were victimised and harassed, medical facilities were raided, and ambulances attacked. "The public health issues come up when there are issues with governance, issues with political unrest, instability," said a public health specialist at a local NGO that advises Zimbabwe's health ministry, asking to remain nameless for fear of reprisals. "The stay-away also means that basic services [like those] at the city council are not being rendered," the specialist said. Such services include the maintenance and repair of sewer lines and water pipes - critical to preventing contamination and ensuring hygiene standards in a country tackling a series of cholera, dysentery, and typhoid outbreaks. For cholera patients needing treatment, public unrest can also lead to delays in the sick reaching health centres. "Some doctors couldn't make their way [to hospitals during the protests] because they feared for their safety," the public health specialist added. Mnangagwa has called for a national dialogue to resolve the crisis. However the Crisis in Zimbabwe Coalition said the environment was not yet conducive to talks as "false accusations and charges" continue to be labelled against labour and civil society leaders, while violence by security forces has not ceased. The group warned of "greater chances of escalation of social unrest and instability" if this volatility is not addressed. South Africa's president said Zimbabwe's crisis was a challenge for the whole of Africa, and called for international sanctions to be lifted as a means to ease the situation. Some reports say up to three million Zimbabweans already reside in South Africa, both as legal and undocumented residents. Amid concerns over a new "influx", South Africa's main opposition party said officials along the border between the two countries told them as many as 130,000 people made the crossing from Zimbabwe in just one day last week. "I study migration in response to crisis, and Zimbabwe is my main case study," Chipo Dendere, an assistant professor of political science at Amherst College, told IRIN. "People will want to leave, and they are already doing so." "The mood is bleak. The hope from November 2017 is gone. The danger with this new type of hopelessness is that it opens doors for extremists," she said. "Under Mugabe, people would say anyone is better - they held on to that. Now [Mnangagwa] has crushed that expectation of anything better. By increasing open militarisation of the state, [Mnangagwa] has failed to create the needed illusion that Zimbabwe is a civilian government, and that is scary for people."